To make your Los Angeles trip as much fun as it can be, you'll need a few good apps. You can use them for everything from finding things to do to saving money on attractions and events, getting reservations at the city's top restaurants and digging out those unique things that will make you feel like you're going to swoon with happiness. Unless otherwise noted, all apps are available on iTunes and Google Play. Many people will already have these apps. If you don't, consider downloading them before you start your trip. Google maps is your best bet for navigating LA streets and freeways. Waze is useful for traffic information, but in LA it can sometimes take you through neighborhoods with narrow hillside streets, creating safety issues for residents. Ridesharing App: Uber or Lyft will get you where you're going, but in LA, Lyft drivers tend to be more friendly. Zillow: Even if you aren't planning to buy a house or rent an apartment, almost every visitor ends up wondering: "how much would that mega-mansion cost?" Zillow can answer that question in an instant. If you do a lot of online searches when planning your trip, the Pocket app is an excellent place to save all those articles you find along the way. Best App to Find Things to Do: Discover L.A. The Discover L.A. app is so good that even locals should be using it on a regular basis. Instead of leaving you scrolling through a long list of things you might or might not want to do, it offers curated experiences categorized by interest. Use the app to find a perfect park, track down a tour, find out where to go hiking on hidden stairs, or jump right into a list of the top spots in town. But beware: Only members of the Los Angeles Tourism & Convention Board are included. In Los Angeles, temperatures can vary much as 20 degrees between the ocean and the valleys. It might be foggy at the beach and sunny in Pasadena, all at the same time. No matter what your favorite weather app is, you need Dark Sky when you're in LA. It delivers hyper-local forecasts with what some people call “shocking” accuracy and will help you find out when that June gloom is going to clear up. Apps can enhance your experience at many LA attractions, and you should check the website of every place on your to-do list to see if they have one. Check the reviews before you install: Some promise more than they deliver, want to track your location even when not using the app, or create more annoyances than they intend to remove. Universal Studios Hollywood has a good, well-rated app (look for their Official App). For Disneyland, you'll need these recommended apps to maximize your fun. Knotts Berry Farm and Magic Mountain also have apps which may be helpful but are have some drawbacks. Among LA's museums, the Getty360 app was rated one of the Wall Street Journal's best apps for visiting museums. 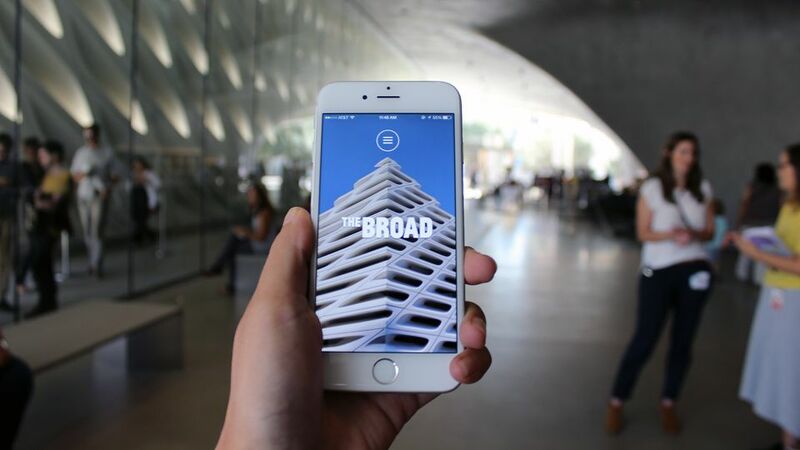 The Broad Museum downtown offers several tours through their app, including a family audio tour "Looking with LeVar," narrated by actor, director, and education advocate LeVar Burton. You may already use Yelp and Open Table to get restaurant reviews and make reservations. You might even have Postmates or DoorDash. They'll come in handy in LA, too. If you're looking for food so amazing that you'll be photographing it not just to show off but to remember how good it was, you need a couple of other apps in LA. Many of the city's hottest and best-rated restaurants use Resy for their reservations. If you're too tired to go out or want to take something delicious on a picnic, use Caviar to get something delivered from some of the city's more popular restaurants. Everyone talks about LA traffic, but few want to discuss its dirty little secret: a good parking place can also be hard to find. Use Spot Hero or Park Me to explore your destination before you get there and you might save a lot of money. You can also use them to reserve a parking spot ahead of time if you're headed for an event or location where parking spots might fill up. It's way too easy to forget where you parked your car in a strange place. You could drop a pin on your Google map, but Find Your Car from Augmented Works is far friendlier and easier to use. It's only available for iPhones. Goldstar is a free service that offers tickets to concerts and other events, often at deep discounts. It can also save you money on attractions tickets. Today Tix is perfect if you're looking for something to do within the next week. You might find a play to see in one of LA's 99-seat indie theatres, a famous opera starring an even more famous singer, or a musical concert to attend. To make it all even better, their discounts of up to 50 percent can make these live performances less expensive than a night at the movies. No matter what you think about Twitter, it's your best resource for finding some of LA's best things to do. Follow @thebroadstandby for the up-to-the-minute status of the Broad Museum's standby line. @lafoodtruck will keep you informed with a weekly rundown of LA's food truck scene, and you can follow @eaterla for news about the food scene in general. And if you're worried that every little jolt or bump might be an earthquake, @earthquakesLA will tell you. If you're worried about earthquakes in Southern California, you might wish for a predictor app, so you have more time to panic before the shaking starts. It's not available to the public yet, but you can sign up now for Quake Alert from Early Warning Labs which has shown a lot of promise to give you at least a few seconds notice. That is, as soon as it gets government approval. In the meanwhile, you can enjoy the real California earthquake experience and be just as surprised as everyone else. If you love learning about the past, you can use HISTORY Here from A&E’s History Channel to discover places like Raymond Chandler’s first apartment, a Mexican-American War battlefield, or the original Bob’s Big Boy restaurant. If you can’t resist kitsch, the app from Roadside America can take you to see the Chicken Boy, a giant donut, or a fountain made entirely of concrete bedpans. It's available for iPhones only. Does the Go Los Angeles Card Save You Money?